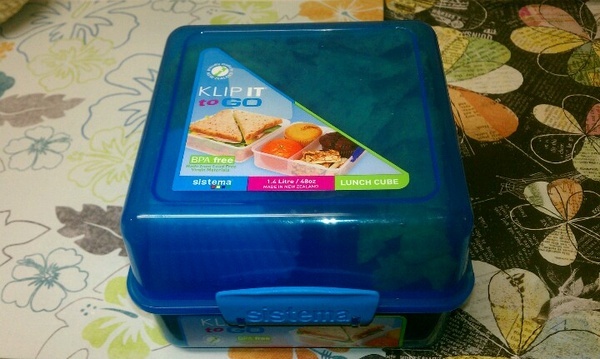 3rd graders lunch: You would be amazed at how much you can pack into this little box by Sistema! 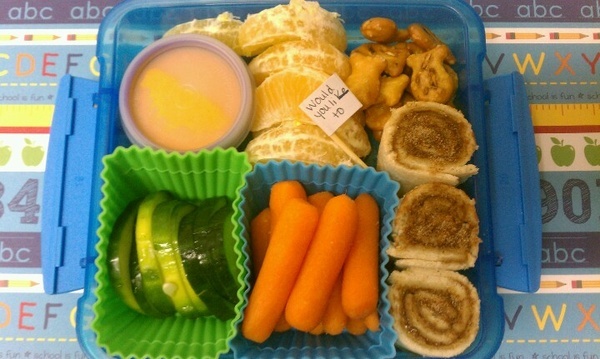 Starting at the top this lunch has French Dressing( to dip the veggies in) a little Smidget Tupperware cup I ordered from Amazon, beside that are peeled Clementines, pretzel goldfish, cucumbers, carrots and Reese’s Cup Sushi Rolls with Cinnamon on top (kids request). I added another of the same container and filled it with some left over chips. As you can see we had another day of those AWESOME Reese’s Cup Sushi Rolls. Tucked behind the rolls is a little surprise for the kiddos. A piece of mint chocolate from the Dutch Market near my job. That chocolate is so good I almost took it for myself but i decided to be Super Mom and send it anyway. Beside the rolls is French Dressing mixed with Baba Ghanoush, grapes, carrots, oyster crackers and a piece of ZucchiniBread. The verdict is out on how they feel about the Zucchini Bread since this box went with them today! 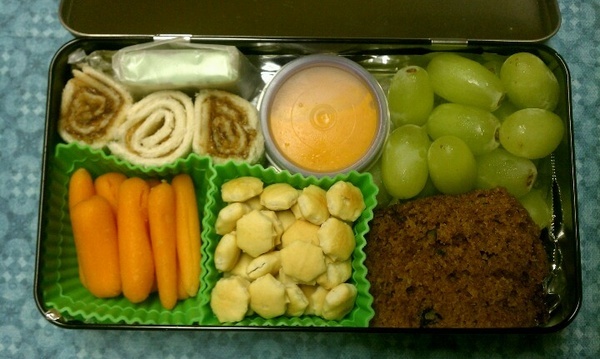 This is the newest Bento that my 2nd grader received as a birthday gift. This was also our first time packing it. It look relatively small but this little guy holds alot of food! 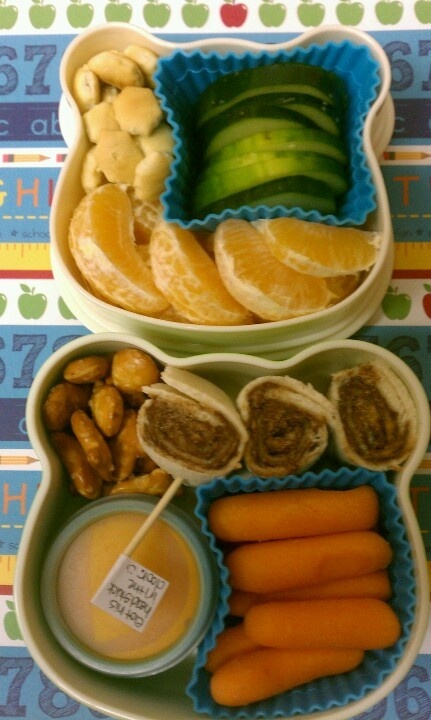 Oyster crakcers, cucumebers, Clementines, Goldfish pretzels, Reese’s Sushi Roll, Carrots and French Dressing. This is the little lemon shaped box I found in the dollar section at Target. 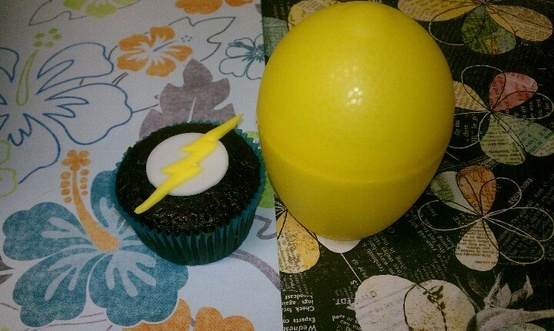 I made Flash cupcakes for the 2nd graders birthday and decided this would be great to put them in. This is another Sistema product that I really like. Its three parts, as you can see. One part closes off and the other is divided into two sections. Cool Ranch Doritos, Cupcake Goldfish grams, Champagne grapes, apples,carrots, Baba Ghanoush and turkey rolls. This box closes up really nicely! 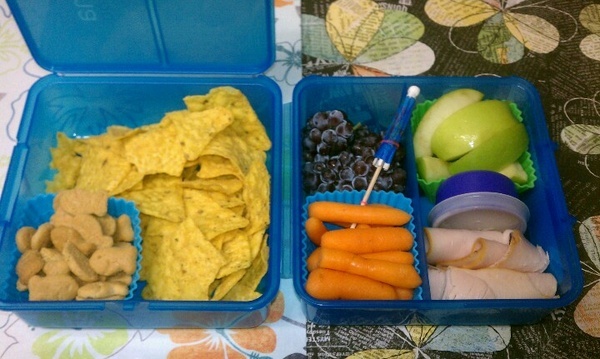 Hope you enjoyed our weekly Bento Post! I need some ideas for other Bento Ingredients. Have any? Feel free to share! Thanks! Next Post Bento Box for 9/4-9/7 + My first and last intricate bento box!! The verdict is in on the Zucchini Bread. They loved it and asked for more when they got home. LOL!